Cost to repair flooring varies greatly by region (and even by zip code). 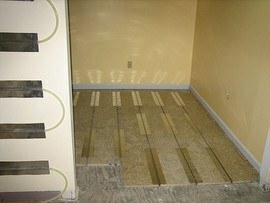 Get free estimates from flooring contractors in your city. Cost to repair flooring varies greatly by region (and even by zip code). How much does it cost to repair flooring? Repairs to blemished or damaged floors can boost the appearance of a home and can be more cost-effective than replacing the material in a room. This cost guide looks at the cost of repairing a moderate blemish around the size of 25 sq.ft. in a 200 sq.ft. area including a variety of standard flooring materials. Removing and replacing a few tiles is not easy or quick, but typically very cost effective. Tiles can crack, discolor or come loose and need repair. $100-$500 in materials. Tile costs range greatly based on the style and material of the tile. Tile layers typically charge between $40-$60 per hour, and it will take 3.5 hours to repair 25 sq.ft. of tile for a total labor cost of $140 -$210. 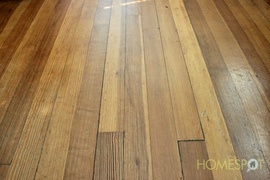 Typically, repairing a hardwood floor means refinishing the floor. Ideally the entire area will be refinished to avoid an uneven final result. Stains, scratches or rotten floors will all need address. Spot repairs, including replacing boards, typically cost $250-$600 for a 200 sq.ft. room. Sanding 1, staining, and sealing 200 sq.ft. costs between $200- $400. Flooring experts charge between $60-$75 per hour, this work would be expected to range between 10 and 12 hours, for a total cost between $600 and $900. Repairing linoleum 2 is typically not the approach taken by professionals. 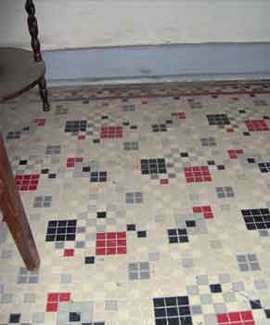 Because linoleum 2 is so inexpensive, when the floor needs to be repaired, it can usually just be replaced for a similar cost. Materials for 200 sq. ft. cost between $500 and $700. Labor to place the flooring is charged between $60 and $75 per hour, this work would be expected to take around 2 hours, for a total labor costs expected of $120 and $150. Carpets can be damaged through flooding, stains or tears. Typically carpet repairs require replacing the material to address issues in the material and subfloor 3. $600-$650 in materials. Carpet costs range greatly based on the style and fiber of the carpet. Carpet professionals typically charge between $60-$75 per hour, it would take 4 hours to lay carpeting in 200 sq.ft., for a total labor costs of $240-$300. Vinyl 4 flooring typically suffer from lack of adhesion over time and scratches or scuffs. These repairs are typically done patchwork style, or by simply reapplying adhesive. 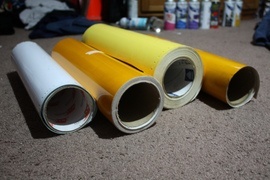 $40-$50 in materials including sheet vinyl 4 $20 for just adhesive costs. Flooring professionals charge between $60-$75 per hour. Patching and/or reapplying adhesive in a 20 sq.ft. area will take 2 hours, for a total labor costs of $120-$150. 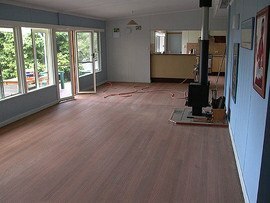 Laminate flooring is made to look like real wood, but is easier to install, and easier to repair. Buckling, scratches or stains can be replaced by unsnapping the flooring and replacing it. It is time consuming but inexpensive. $60-$75 for materials to repair or replace a 20 sq.ft. area with new laminate planks. Flooring experts typically charge between $60-$75 per hour. Removing surrounding planks, replacing damaged planks, and relaying planks is estimated to take 8 hours, for a total labor cost of $480- $600. Add designer touches like wire brushing or custom aging techniques for hardwood floors for between $3-$5 per sq.ft. Replace subfloor 3 under a tiled floor, it won’t take more than a few hours to repair, and it will cost around $10-$20 per sq.ft. Add radiant floor 5 heating where flooring is being replaced for between $6000 and $14000. Repair a joist for around $100-$300. Repair a tilted, bouncy or wavy floor for between $1000 and $3500. Costs can increase by up to 20% if the area is difficult to access (e.g. : stairs). Damage to the subfloor 3 from insects or water can increase the cost significantly as the entire subfloor 3, joints 6 and beams may need replacing. Minor stains in carpets can be cleaned for $50-$100. How much does it cost to repair flooring in my city? Cost to repair flooring varies greatly by region (and even by zip code). To get free estimates from local contractors, please indicate yours.